ISPARC Move | Play | Compete – Six Outstanding Indigenous Youth Athletes Receive Prestigious Award! 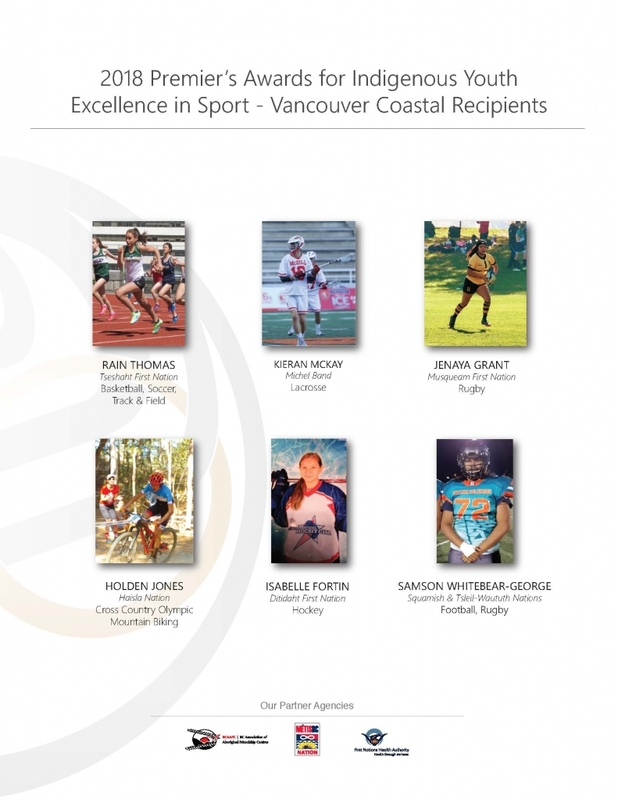 Six Outstanding Indigenous Youth Athletes Receive Prestigious Award! Photo Credit Kevin Shoesmith (Back row) Rick Brant, I·SPARC Executive Director, Spencer Chandra Herbert, MLA, Vancouver-West End, Courtenay Gibson, I·SPARC Regional Lead, Vancouver Coastal, Robert Smyth, School District #44, Principal, Cameron McBeth, Vancouver Aboriginal Friendship Centre, Darcy Patterson, BC Rugby, Alex Nelson, I·SPARC Senior Advisor, Kim Brooks, First Nations Health Authority Executive Director, Vancouver Coastal Region, Janelle Tom, First Nations Health Authority. (Front row, Recipients) Samson Whitebear-George, Isabelle Fortin, Holden Jones, Jenaya Grant, Kieran McKay, Rain Thomas. Vancouver, B.C. 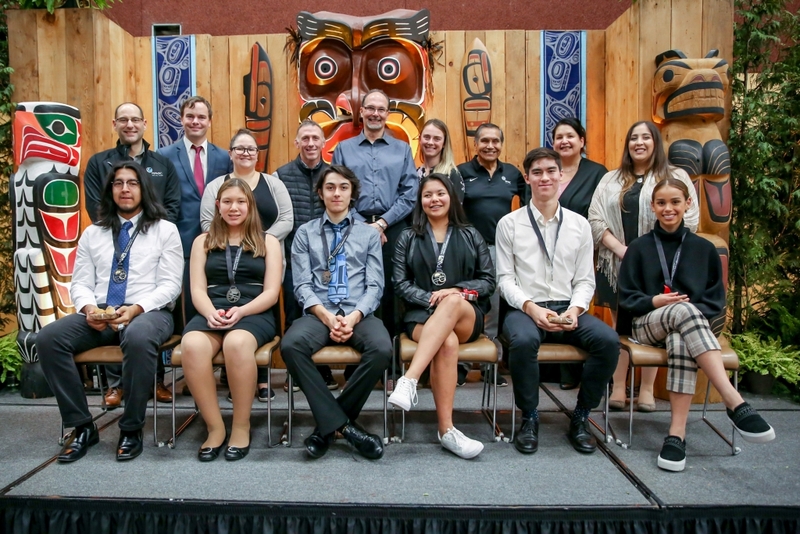 (November 16, 2018) – The 2018 Premier’s Awards for Indigenous Youth Excellence in Sport were presented last night to six outstanding Indigenous youth athletes from British Columbia’s Vancouver Coastal Region. The Awards were presented by Spencer Chandra Herbert, MLA, Vancouver-West End during at a formal celebration held at the Musqueam First Nation Community Centre in Vancouver, BC. Vancouver Coastal is the fourth of the Indigenous Sport, Physical Activity & Recreation Council’s (I·SPARC) six regions to honour Indigenous athletes through this unique province-wide awards program. I·SPARC, in collaboration with the Province of British Columbia, launched the regional nomination process in August 2018, receiving nominations from across the province for Indigenous athletes under 25 years of age who are competing in performance sport and committed to living healthy, active lifestyles. A total of 47 recipients were chosen within I·SPARC’s six regions – Northeast, Northwest, Interior, Fraser, Vancouver Coastal, and Vancouver Island. These Regional recipients automatically serve as nominees for the Provincial Awards. A total of 12 Provincial Awards (six male and six female) will be selected in January 2019. Provincial recipients will be presented with their award at Gathering our Voices: Indigenous Youth Leadership Forum in Port Alberni March 19-22, 2019. Throughout November, the two remaining regions will host formal celebrations to honour their 2018 Regional Premier’s Awards recipients.